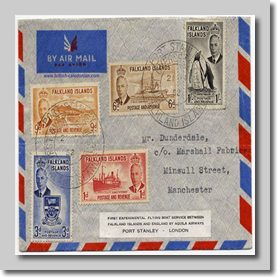 Carrying the Royal Mail has always been seen as a measure of an airlines status; to be trusted with the safe care and transport of the mail is an important duty. 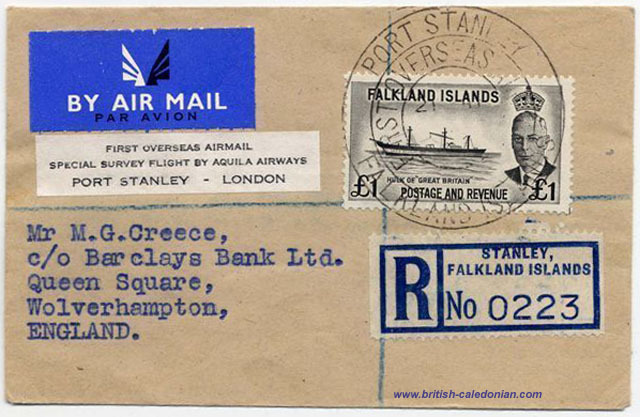 In BCal's lineage Airwork, Olley and Transair were all granted a licence to carry the mail, which was no mean feat when this duty was usually only given to State airlines at the time. 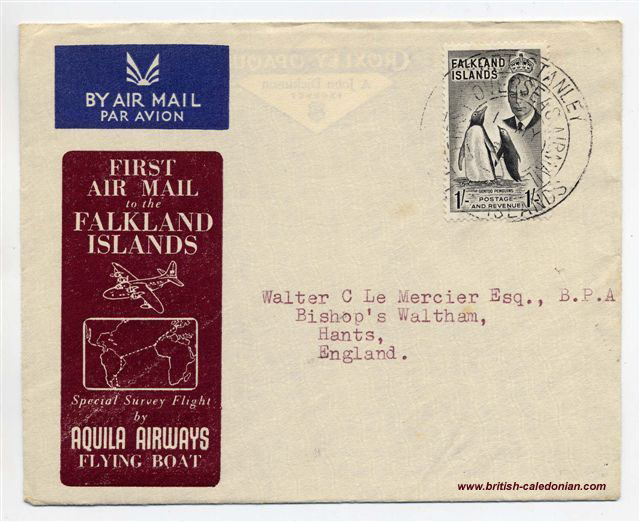 BCal were, of course, a Royal Mail carrier too. 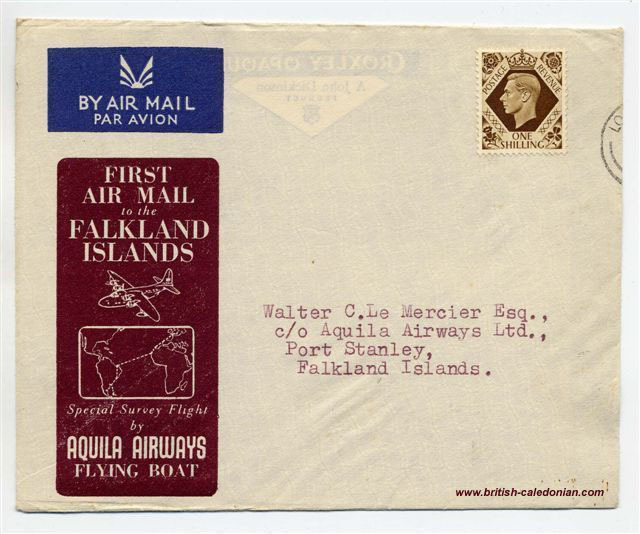 Aquila Airways, also in BCal's lineage, were also designated a Royal Mail carrier and their aircraft flew under the title, RMA - Royal Mail Aircraft. 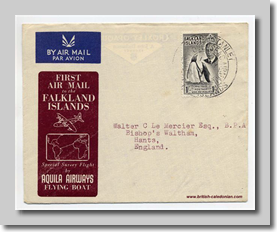 But back in 1952, Aquila set about a major undertaking with one of their flying boats. 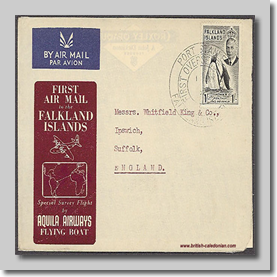 They were commissioned by the Falkland Islands Company to carry out an Air Mail expedition / survey flight to the Falkland Islands from the UK. 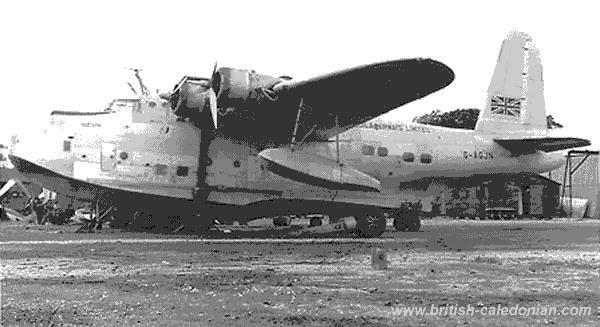 Flying Boat RMA Hudson, G-AGJN, a Hythe flying boat which was a variant on the Shorts Sunderland Mk3 was to make the long flight. 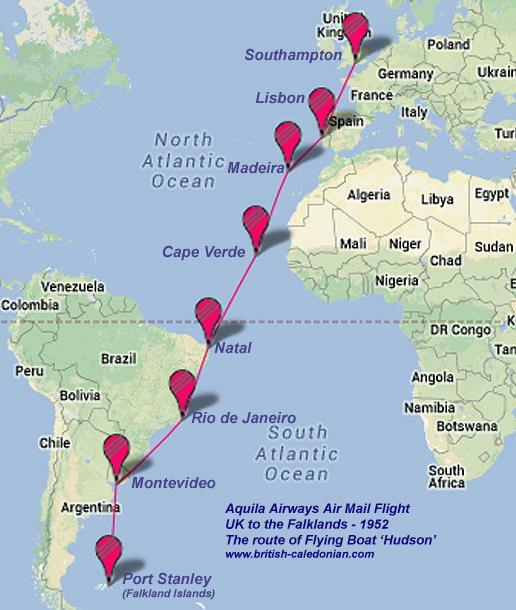 On the 21st April 1952 Hudson and her crew set out from Southampton, coverng the 7563 miles (6576 Nautical Miles) via Lisbon, Madeira, Cape Verde, Natal, Rio de Janeiro and Montevideo arriving in Port Stanley on 28th April 1952. 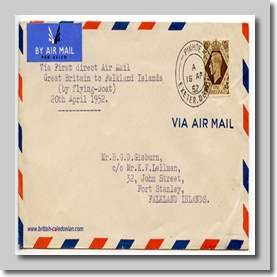 Hudson was commanded by senior pilot, Captain Douglas Pearson, and his crew were:- First Officer Jack Jessop, Radio Officer Mike Bedford, Engineering Officer Jack Horan, Engineering Officer Bert Dawson, Navigation Officer W.P Robinson, Steward David McInroy and Air Hostess Veronica Mills. After their epic southbound flight they had a few days to rest and to ready RMA Hudson for the flight back to Southampton. 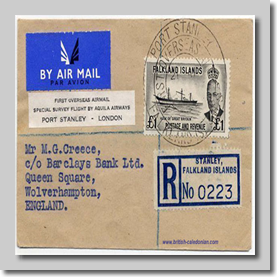 They left Port Stanley on 2nd May and arrived back in Southampton on 8th May 1952, some 16,000miles successfully flown. The Hythe was not a fast aircraft, they had a top speed of 175mph, and a cruising speed of 165mph; no auto-pilot, this was hands-on flying for around 96 hours in total. 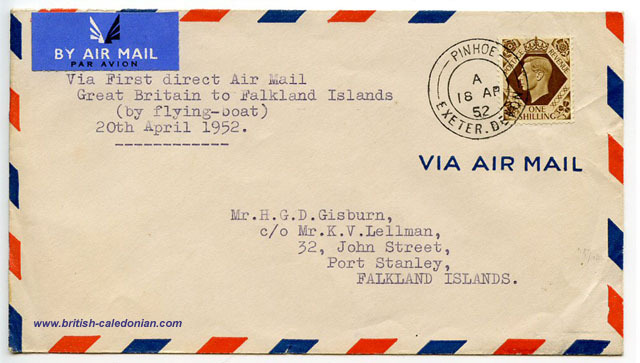 Below there is a list of the legs flown and their distances, also the specification for the Hythe; then some of the actual air mail and commemorative covers flown too and finally some commemorative stamps. Aquila Airways G-AGJN Hudson; out of the water in the UK. 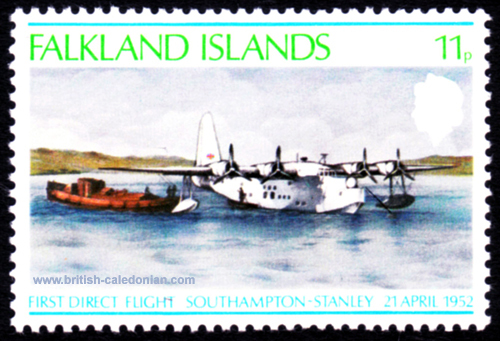 The epic journey of Hudson and her crew was not forgotten, and in 1978 these commemorative stamps were issued in the Falkland Islands. 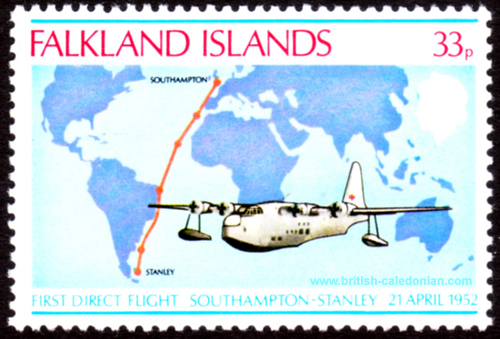 The 11p stamp shows Hudson moored off of Port Stanley and the 33p stamp records the route they took. 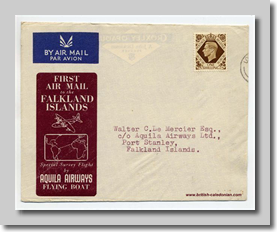 I mentioned to my Husband (Trevor Tommy Gunn) that I was sure that was the airline my father (David Sayer) used to be an Engineer for, working on the Flying boats. 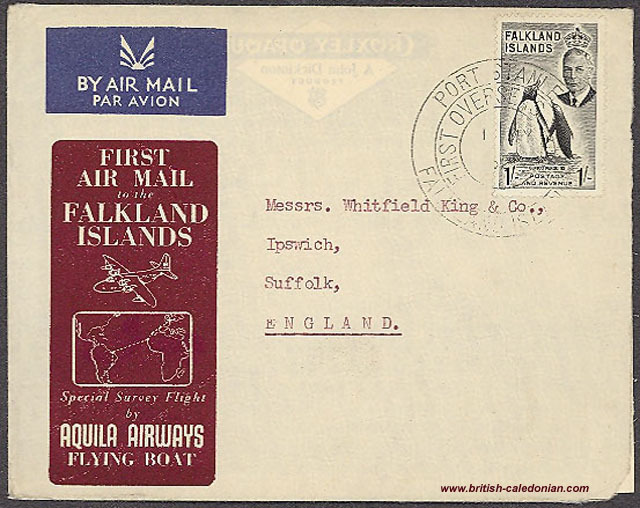 I then saw the Ist day covers to and from the Falklands, and mentioned that I am sure I remember, my Great Grandma showing me one of those many years ago...... I then looked closer at the name on the envelope and saw it said Walter C Le Mercier Esq. well that was my Uncle Gus, who was my Great Grandmas son......What a coincidence! Unfortunately my father, Uncle Gus and my Great Grandma are no longer with us. Angela worked as Passenger Services Agent for BCal back in the mid 70's and Trevor was with BCal flight dispatch. Aquila's RMA Hudson - G-AGJN - moored in Stanley Harbour, Falkand Islands. 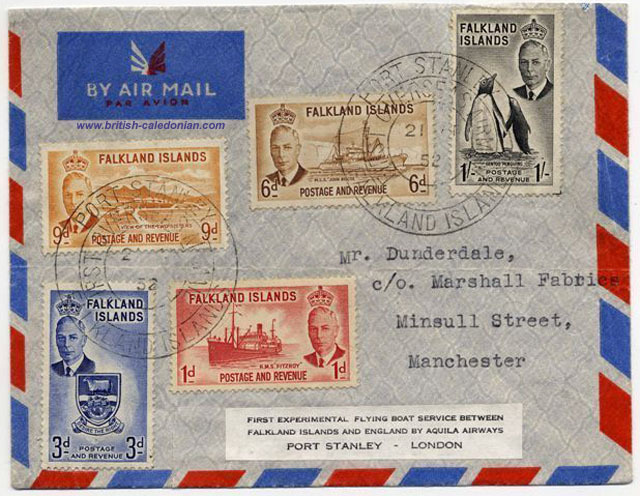 This photo was taken by Chris's grand father, who was a ships master and also a Falkland Islander.